Desks come in all sizes and shapes... we have built many types, but if you want something completely standard, the office supply or furniture stores can provide something from a factory that is probably cheaper than we can build it. If you have a special size or space requirement, or want a combination of features that you can't find in a store, or want something especially beautiful and durable, we can help. 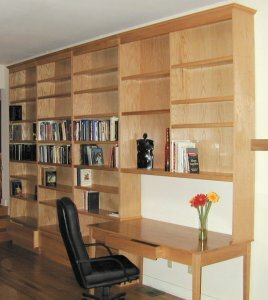 The classical partner desk is 36x60 inches or larger - too big to readily go through a standard doorway or around a household corner. Further the classical desk assumed a secretary would handle all filing since drawers on both sides of the desk would be unnaturally shallow. Our current recommendation for partner desks is matching desks that can be put together end to end or back to back. The separate desks gives us two big things... future flexibility in the way they are used, and the ability to move them ourselves, without a piano moving team. Each desk is 24 x 60 inches - the 24 inch depth makes passing papers easier when they are back to back, yet is ample for today's flat screen computers. The 60 inch width allows standard desk drawers on both sides. When the desks are placed back to back, you are close to the typical partner desk configuration. The 24 inch deep desks seem ample, especially with today's flat computer monitors, and are convenient for working together, yet separately. These are prototype units, in our home, that we have found work great. The large number of drawers (9 on each side) has enabled us to "clean up" the office substantially. Each side of each desk has a file drawer for hanging folders, plus three smaller drawers and a pull out tablet. There is a center drawer. The top overhangs slightly at the back so we could run wires between the desks if necessary. We chose not to put a "modesty panel" at the center back, since we are unlikely to place these in the middle of a room, but the back of each desk is finished with raised panels, like the sides, so we could use it that way if desired. How did we come up with this configuration? A standard office desk (remember the days before office cubes?) is 30 by 60 inches. In really old (antique) times, partners sometimes shared a desk 36 by 60 inches, facing each other - but those were the days when everyone had a secretary to manage papers, so drawers were not an issue. A modern executive desk can be any size that fits the executive's ego (and the office elevator), but if there is a standard, it might be a 36 by 60 inch desk with a slight knee space for a visitor to pull up to the "visitor side" of the desk to review and sign documents. We tried designing a two person desk using the "classic" 36 by 60 overall size. That means each person only gets 18 inches depth, not much for monitor, keyboard, and work area. With that narrow desk, the drawers on each side are only 16 inches deep - we even got to the point of buying the drawer slides to build one, and were shocked at how small a 16 inch deep drawer would be. Okay, so if you want "normal" drawer depth, why not just put two regular desks back to back? We tried, and discovered another problem: Thirty plus 30 inches, or even 24 plus 30 inches was too wide to easily pass papers to each other (Did you see this document? Your printout got mixed with mine! What do you think of this? Can you give me an eraser?). Not a lot too wide, but still not pleasant. 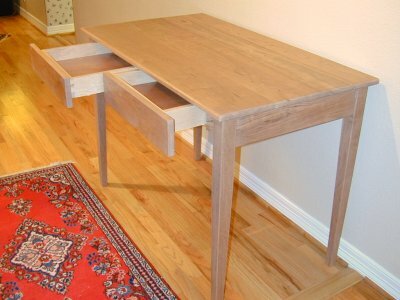 How about a desk with 24 inches available on each side? A "student" desk is typically 24 inches deep - adequate for papers and electronics, and with two 24 inch desks, the "partners" are 6-12 inches closer to share documents. That seems like the best arrangement, except a single desk 48" deep, 60 inches wide, and 30 inches high, with 14-18 drawers, is a monster. Can anyone say grand piano? Will you be able to move the desk? Will it fit around corners? Now we are back to two matching desks. The desks shown were built with solid hardwood drawer fronts, desk sides, and backs, plywood top (with hardwood edges), two tablets on each desk, 9 drawers on each desk, on heavy duty metal ball bearing drawer slides. Handles can be added, but there is a finger pull at the bottom of each drawer front. 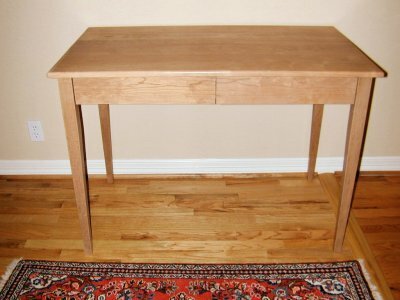 This customer wanted a Shaker-style writing table out of solid cherry wood. It was to be normal desk height - approximately 30 inches, but 24 inches deep, and 42 inches wide, slightly smaller than the normal 30 x 60 office desk size. Two fairly large but discrete dovetail drawers were installed on the same "long" side with premium full-extension bottom mount (hidden) metal slides and closing dampers - the drawers close softly and don't slam. A finger pull was provided on the bottom edge for opening the drawers without drawer pull hardware. 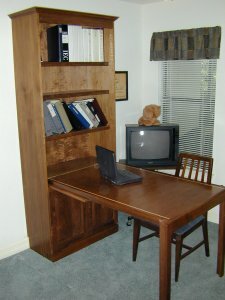 The Murphy desk was originally designed for a guest room/office, used in conjunction with a Murphy Bed. When the room was a guest room, the Murphy Bed was down, and the desk was folded away. When the room was an office, the desk came into the middle of the room, using the same space as the bed. "Vases and baskets" were used for pens and desktop items, and stored inside the closed Murphy desk (there can't be a pencil drawer if the desk folds up). The file drawers were in the cabinets beside the desk, so were accessible when the desk was closed. The original Murphy desk was a "partner desk, usable by two people at a time. We have also built a smaller "one person" Murphy Desk, shown here. These units are built from Walnut wood. The large oak library included a table that was, in fact, used as a desk by the owner. The table was 30 by 60 inches, and had a drawer much like a traditional center desk drawer. The owner's laptop computer was a frequent occupant of the space, but would disappear when entertaining. This desk was built to the customer's specifications to support 7 computer monitors and multiple computers in a stock trading configuration. My only picture is outside my shop, still on moving dollies. It is large - approximately 50 x 92 inches, so it had to be disassembled for moving and delivery ... the top removed, and other components moved separately. Two level working surface, and compartments for hidden wiring. Full height modesty panel, and 7 drawers on heavy duty full extension metal glides. A standard office desk is 30 by 60 inches, and has drawers in two pedestals, on both the left and right of the knee space. Some desks are only 24 inches deep, used where space is a problem and there aren't a lot of papers or equipment on the desk. The drawers in an office desk are about 13 inches wide, so file folders can be placed across the drawer and papers can be placed cross-wise in the drawer. Home desks sometimes have narrower drawers so papers are put in the drawer lengthwise, allowing a slightly smaller overall desk size. If you want room for a full size office chair, the "knee space" must be 28 inches wide. Full size chair arms may not go under the typical center drawer (but allowing the chair seat under the desk, without the arms under the drawer, is often acceptable. A "partner" desk traditionally was 36 inches deep (or even larger) so people could sit on both sides of the desk, but still easily share documents. See our discussion above about the depth necessary for two people facing each other. An "executive desk" may be wider than 60 inches, and may be 36 or more inches deep, with an overhang so visitors have knee space if they pull up to the desk to review or sign documents. 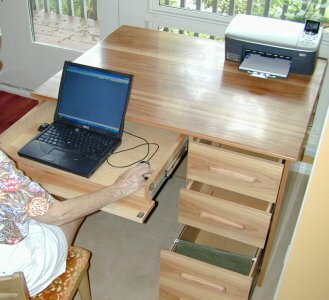 Personal computers and printers were initially built into special desks, but the size, shape, and power (heat) issues have changed faster than the desks. Generally I like to recommend that the location of computers be considered, but that special compartments NOT be built - the desk will last far longer than the computer components that fit the special spaces. Most desks are 29 to 30 1/2 inches high, similar to dining room and game tables. If you prefer a lower level for your keyboard or laptop computer, the center drawer can be made into a computer tray. Drawers are a major decision when designing a desk. Too few drawers, and you probably won't enjoy working at the desk. But adding lots of drawers drives the cost up rapidly. Planning the number and type of drawers may be the hardest part of the design. This site (layout and contents) ©2003-2015 by Charles A. Plesums, Austin, Texas USA. ALL RIGHTS RESERVED.